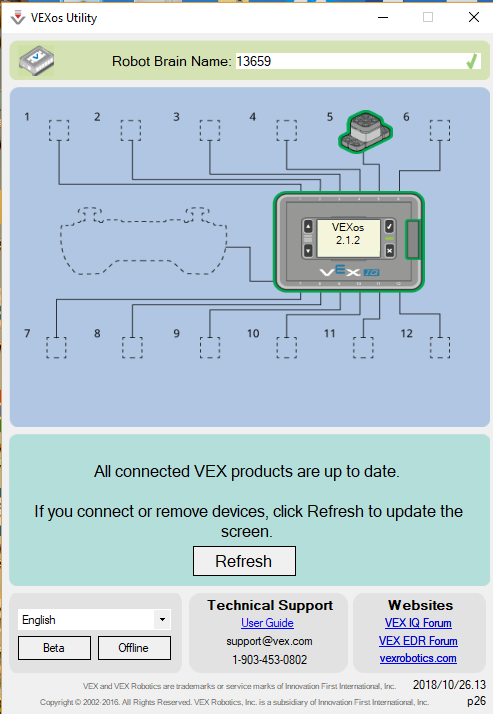 I have a ‘Smart’ motor that all of the sudden self-identifies as a bumper sensor in both the Device Menu and in the VEXos Utility. Is there any way I can update/reload the firmware so it shows up as a motor again? I have a motor that was not registering at all when I plugged it in (showed empty port), and now it is recognizing it as a bumper switch occasionally. When I click detect device port 1, it flashed as a yellow outlined motor, then nothing. Do I click “force update” on the brain, or it that motor just dead? I too have a similar issue that no amount of updating is fixing. I have a permanent bumper switch showing on port 5 when it is empty. I also have a motor that shows up as a bumper switch no matter which port it is put in or if it is updated. If a motor that isn’t affected this way is plugged into port 5, it shows as a motor, but once it is removed, shows up as a bumper again.